"Quick, easy, and delicious. 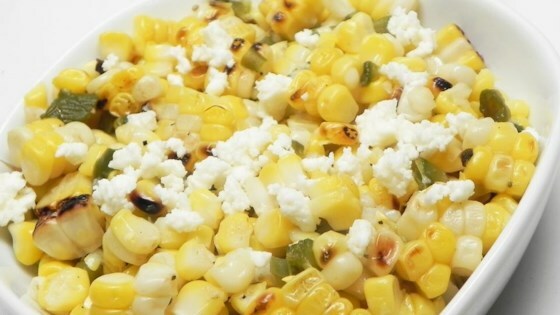 Great way to enjoy grilled corn and fresh green chiles." Cook corn and chile pepper on the preheated grill until corn is slightly charred and chile pepper is blistered, about 20 minutes. Place chile pepper in a resealable plastic bag. Let steam until softened, about 5 minutes. Peel skin off chile pepper and chop. Cut corn kernels off the cob into a large bowl. Stir in chopped chile pepper, goat cheese, lime juice, salt, and black pepper. Substitute another type of green chile pepper for the Hatch if desired. Perfect as written and 5 stars all the way!